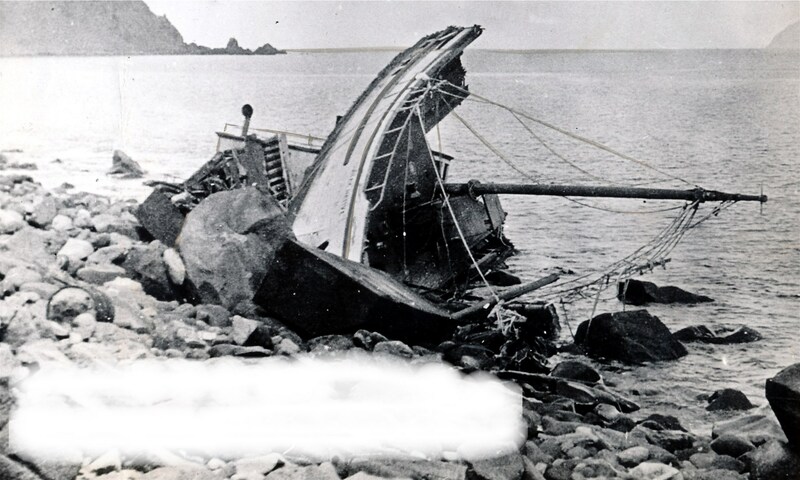 C I P NO 1 (1943) The 49 ton 60 foot wooden scow C I P No 1 foundered February 16, 1943 off Otter Point, Umnak Island. CALICO DOG (2006) The 32 foot cod fishing vessel Calico Dog capsized May 7, 2006 while rounding Priest Rock on her way into Unalaska Bay. A series of waves pounded the vessel causing her to keel over. There were two crewmembers on board and 2,700 pounds of freshly caught cod fish in totes. One crewmember was able to crawl onto the overturned hull of the Calico Dog. He was rescued 12 hours later by the Alaska State Trooper vessel Stimpson who spotted him waving his arms as they were transiting the area. Lost was Norman Fain. The Calico Dog had recently been purchased and was due to be renamed the Lady Alliene. CAPE SPENCER (1964) The 185 ton 85 foot wooden oil screw fishing vessel Cape Spencer stranded and was lost February 10, 1964 on the south shore of Akun Bay. CAPTAIN BILLY (1988) The 83 foot trawler Captain Billy was driven onto the rocks by high winds and heavy seas and destroyed February 17, 1988 on the southeast shore of Yunaska Island in the Aleutians. All six crewmembers made it to the beach. There they built a fire and were later rescued by the U S Coast Guard. CARLEY RENEE (2009) The 59 foot fishing cod fishing vessel Carley Renee capsized at 10:30 p.m. October 30, 2009 approximately 22 miles east of Unalaska Island. All four crewmembers abandoned ship in survival suits, deployed the life raft and were picked up by the fishing vessel Guardian. The Guardian was responding to the Urgent Marine Broadcast issued by the U S Coast Guard when they intercepted the MAY-DAY call from the Carley Renee. The overturned vessel grounded on Egg Island and Magone Marine was called upon to attempt salvage. During the effort to recover the Carley Renee and move her to a more protected location in Beaver Inlet, she sank in 120 fathoms of water near Sedanka Passage. CHAOS (2013) The 54 foot longline fishing vessel Chaos parted her anchor line in heavy weather and grounded on the west side of Unalaska Bay September 20, 2013. All four persons on board were able to make it safely to the beach but the cover of darkness, sheer cliffs and high winds prevented the U S Coast Guard from affecting a rescue until daylight. During the night, winds became so severe that rocks began blowing off of the cliffs and pelting the crew of the Chaos below. They were forced to return to the Chaos to seek shelter and suffer through the pounding that the vessel was taking from the heavy seas. Winds were 50 gusting over 80 mph with rain. They were rescued the following morning by an MH-60 helicopter that hoisted all four to safety. The Chaos became a total loss. CHERIBON MARU (1942) The 4,016 ton Japanese cargo ship Cheribon Maru stranded on a reef while being attacked by four U S P-38 and four B-26 aircraft November 28, 1942 in the west arm of Holtz Bay on Attu Island. The vessel capsized and sank December 14, 1942 in 100 feet of water. CHEVAK (1994) The 117 foot crab fishing vessel Chevak stranded and was lost February 22, 1994 on the rocks near Reef Point at the entrance to Saint Paul Harbor. The vessel was broken up by foul weather. All seven crewmembers were rescued by a launch from the U S Coast Guard Cutter Hamilton and transferred to the tug Fidalgo. CHIL BO SAN NO 6 (1985) The 285 foot South Korean trawler Chil Bo San No 6 was abandoned by her crew of 29 January 21, 1985 approximately 200 miles northwest of Adak Island. The vessel was reported to be in a sinking condition. The crew was rescued by another Korean vessel in the area. CHIL BO SAN NO 6 (1989) The 285 foot South Korean trawler Chil Bo San No 6 broke a propeller and drifted ashore January 11, 1989 two miles south of Spray Cape on the west side of Unalaska Island. All 54 crewmembers were rescued by two U S Coast Guard helicopters and a small life boat from sister ship Pung Yang Ho. Later the Chil Bo San No 6 was washed over a reef and settled on the rocks in a small cove. CHILIAN (1901) The 248 gross ton bark Chilian struck a rock and was lost at 9 p.m. on November 30, 1901. The tragedy occurred on the south side of Dutch Harbor on Unalaska Island during a blizzard. The vessel was abandoned and sold at auction on December 7, 1901. She was reported to be worth $30,000 at the time of the accident, the only cargo being her ballast. Source: U S Customs Wreck Report filed at Unalaska December 7, 1901 by her master, James H Kinney of Alameda California. CHINA B (2006) The 47 foot steel halibut longline fishing vessel China B capsized and sank September 6, 2006 approximately 30 miles north of Saint Paul Island in the Bering Sea. A series of large waves came over the stern and the vessel sank in less than five minutes. All five crewmembers abandoned ship to a life raft and were rescued by the fishing vessel Golden Chalice. The rescued crewmen were Capt. Kirk VanDoren and Art Gamash of Homer, Dan Ingram and Shawn Dochtermann of Kodiak and Mark Worley of Gig Harbor, Washington. CITY OF SEATTLE (1988) The 92 foot crab fishing vessel City of Seattle grounded November 1, 1988 on the north side of the west tip of Atka Island. The helmsman had fallen asleep causing the disaster. There was no loss of life. COMET (1983) The 43 foot halibut fishing vessel Comet flooded her engine room and sank September 25, 1983 approximately 25 miles northeast of Dutch Harbor. The skipper and three crewmembers were rescued by the U S C G Cutter Boutwell after only four minutes in the water. CROWN REEFER (1946) The 5,100 ton USAT refrigerator ship Crown Reefer ran aground and was abandoned January 27, 1946 off of Kirilof Point, Amchitka Island. The vessel was transporting perishables and cargo from Seattle for the Army at Kodiak and on Aleutian Island bases. All 39 officers and crewmembers were rescued by Navy rescue tug. The ship broke up some time later. CRYSTAL S (1974) The 199 ton diesel powered fishing vessel Crystal S flooded, capsized and sank August 12, 1974 approximately 3.5 miles northwest of Akutan Island.